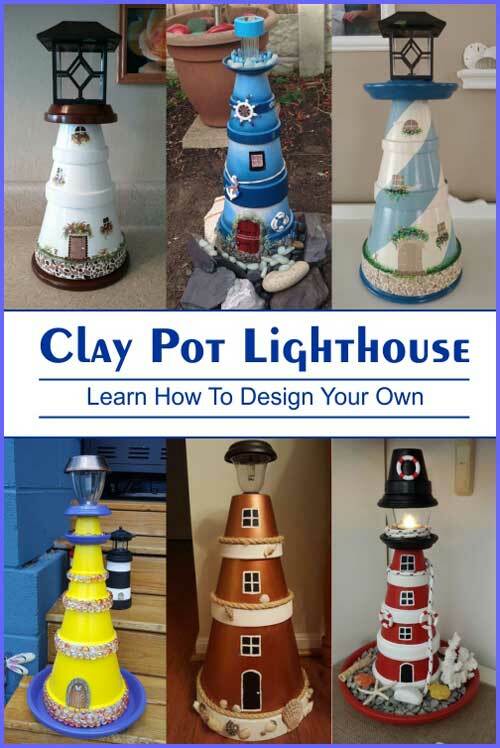 A clay pot lighthouse can be made to any size you wish and, in any style, you please. Before starting your project there are a few things you need to think about. For instance, you can use as few as two pots up to as many as you wish. So, think about the where you want it to go and how tall you want it to be. Firstly start with the size of the base pot, pick one which will fit the area you have picked out. Then, decide how many pots you want to use. 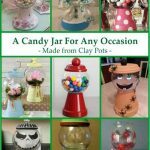 Will you need any clay saucers? 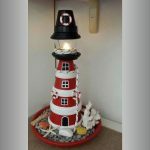 Clay Pot Lighthouse created using only two pots and two clay saucers. 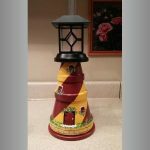 Clay Pot Lighthouse – Using three Clay Pots and two clay saucers. 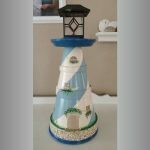 Clay Pot Lighthouse – made using five clay pots and two clay saucers. For this, you can use virtually anything. 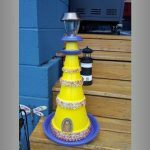 If it is for outdoors, solar lights are a good choice. Because, maintenance is minimal, there are no ongoing costs and there is a vast variety to choose from. Also, you can buy them just about anywhere really, from any garden center, supermarkets in the Summer, or online. 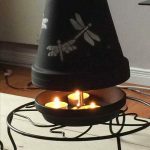 Maybe you could also use battery powered tea lights, candles or a mains connected light [just make sure it has waterproof cables if using outdoors]. So now that you have a good idea of the size you want and the light to use it is time to decide on a design. The first thing you will need to decide is what your base colors are going to be. As you can see with the three below, you really don’t have to get any more artistic than choosing the right base colors. Apart from adding a few windows and a door of course. Unless you want to that is. 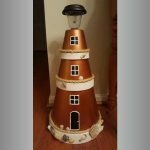 Stunning copper and cream lighthouse. 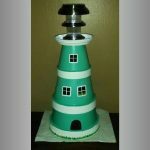 Keeping it simple with this green and white lighthouse. Black rims with alternating grey and white bodies. 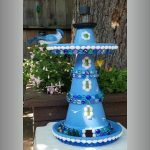 Next, a spiral pattern seems to be quite popular on a clay pot lighthouse. I will explain how to achieve this a bit later on. 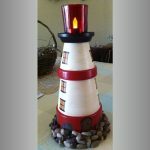 Add a red and white spiral to this lovely clay pot lighthouse for a spectacular change. 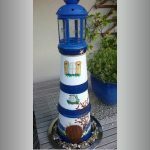 A lovely blue and white spiral effect to this lighthouse. Deep red and yellow for another stunning effect. 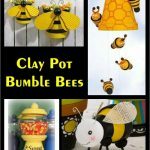 As with many of the clay pot crafts, you can adorn your projects with any number of different things. Such as, little ornaments, glass pebbles, ropes, and netting. 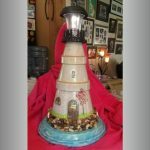 Glass beads ad a lovely shiny finish to this lighthouse. This beachy image is achieved by adding some netting and starfish ornaments. Another way to add a beachy feel is with rope and mini life belt ornaments. Next, let’s see how imaginative we can get. Be as artistic as you wish with this. 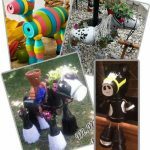 You can hand paint on flowers, windows, doors, grass or seagulls. Or even stencil images on. For a more detailed image, you can even use stickers and cutouts. Let’s face it you can add as much or as little decoration as you please. Dark blue fading to lighter blue on each of the pots really sets the scene. With it’s mostly beige base coat, the artistic paintwork really stands out. White bases and blue rims with beautifully painted character accents. 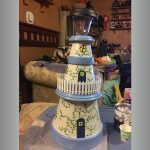 So we have taken it this far, why not push a little further and add a Balcony to your clay pot lighthouse, maybe even a second. 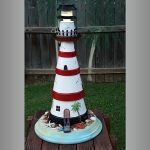 If you’re feeling really bold you could take it even further and double up your lighthouse into a bird feeder as well. Here they have glued an upside down clay pot saucer between the base ans second pots in order to create a balcony made from pegs. In this one they have chosen to make two balconies by using saucers below each of the top two pots. Taking it yet another step further, for this one they have used an extra large saucer, right way up this time to create a lovely bird feeder. 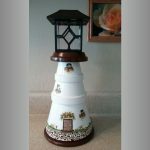 By now you should have a fairly good idea of what you want your clay pot lighthouse to look like and how big you want it to be. So now, I think it is time to move on to how to put it all together. 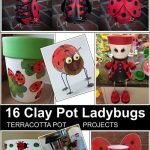 Clay Pots and Saucers – However many you have decided to use. You get to choose! 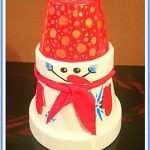 Acrylic Paints – Or whatever paint you choose to use (acrylics cover well for this type of project). You can use spray paints, liquid paint and/or paint pens for this. Water Based Sealer – Any good water-based sealer that can be used on concrete or clay. 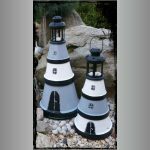 1 Solar Garden Light – Again, your choice. 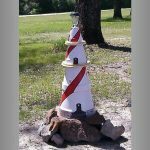 As long as you can fix it to your lighthouse. 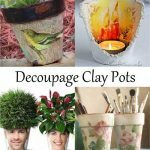 Decorative Bits – These are all the things you are going to glue on, drape on or wrap around. Things like starfish ornaments, rope or netting etc. Craft Tools – Paintbrushes, scissors, very low adhesive tape etc. Before you begin make sure you have thoroughly cleaned and prepared your pots and saucers. If you are using a light with a spike which will drop through the top pot then you will need to make sure the hole is big enough for it to fit. Note: soak your pot for one hour before drilling or filing the hole this will lessen the chance of you cracking your pot. Once your pots and saucers are totally dry you can base coat all your pots using the lightest of your main colors. Allow dry them to dry thoroughly. Stack your pots and draw a pencil line around where they line up. 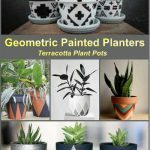 You don’t need to decorate the areas under the other pots. Also if you are creating a pattern that overlaps from one pot to another you will be able to see where to line it up. 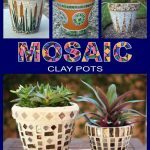 Add your design – you will find it a lot easier to do this with the pots separate. I am not going to go into details about this here as there are so many different things you can do. 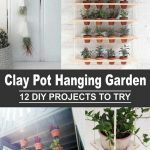 VERY IMPORTANT – Seal your pots. Inside and out. Give them several coats. If you miss any spots you are in danger of moisture getting into the clay and seeping through to your designs. This will cause them to bubble and ruin your artwork. Fix your light to the top clay pot, glue this in firmly leaving no gaps for water to get through. If you are using one with a flat base, you may want to seal the hole first. 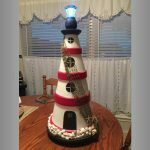 Finally, build your lighthouse. Now it is up to you whether or not you glue your sections together. Depending on the design you may need to. But it is worth noting that by not gluing it will be easier to dismantle for periodic cleaning. So there you have it. 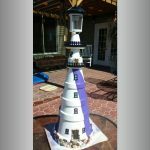 How to build a Clay Pot Lighthouse. I hope you enjoyed my article. 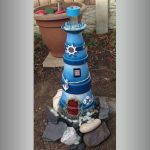 Feel free to send me pictures of your lighthouses, especially if you would like me to feature them on the site.